I’ll try to keep Alpha out and from being a Debbie Downer in my blog. Alpha’s mom returned with a little digital SLR for Alpha to play with, so she and The Cow are learning to use it with *me* as their favourite subject! I hope to have some photos up soon! So far we’ve only taken it on a nature walk to look for spawning salmon in the forest, but there’s plenty of outdoor autumn fun to be had yet. Even with the rain I’ll try to get their butts out to snap some photos of our adventures! This weekend we celebrated Canadian Thanksgiving with a whole lot of Turkey, stuffing, naps, and time with family. While “Thanksgiving” is supposed to be a word of action (more action than sleepily rubbing your round belly full of delicious food, I’m sure), I think part of that action is reflecting on why you’re thankful for the things you think of before you crack into the cranberry sauce at dinner. One of the things I’m very thankful for is family, and being Kyuubi’s blog, I’ll focus on being thankful for the Shiba part of our family. It made me think of Kyuubi and all of the ways she betters each of us as people. Of all dogs Shibas certainly let you know when they dislike something that you’ve done, but they are still so forgiving, so accepting, and so unconditionally loving in spite of our flaws and even in our ugliest temperaments. Kyuubi can always be counted on to relentlessly be herself – she is always proud and this makes her persistent in getting her way. She has a way of making you feel infallible in your darkest moment and making you feel forgiven when you’re the furthest thing from right. She licks your cuts and bruises and all of your salts, she tries to gnaw off your scabs, she kisses you if she forgot you’re not in the mood to play rough. She protects you, selflessly shares her most coveted possessions, and she shows an enthusiastic appreciation for the things she enjoys. She is fiercely loyal and stands up for what she believes in, and she’ll fight furiously at the smell of a threat to herself or one of her charges. Kyuubi embodies all of the qualities that would make us exponentially better as people if we remembered to keep up with those qualities just half the time that she does. Kyuubi also acts as a conveyor for betterment in her physical presence. Her thrice-daily walks through the neighbourhood have enabled us to connect with our neighbours and taking her on errands and to parks have allowed us to bond with people in our community. Her presence on a trip to Oregon this past summer connected us with dozens of strangers curious about her breed and marveling at her appearance/size/behaviour. She has introduced us to a fluid positivity and ease in meeting strangers and neighbours in that language of a love for dogs. Chance comments or warm smiles in her direction open up even the most fleeting of meetings to a warmth and familiarity that has been quashed out when you’re huddled on the bus or irritated in rush hour traffic or waiting in line at the supermarket. Kyuubi reminds us of how wonderful and light that warmth is and just how easy it is to brighten up people’s days in simple exchanges. I’m thankful for Kyuubi being a furry member of our family and all of the ways she connects us to each other and to our surroundings. She acts as a mirror and shows us the best people that we could be and for this I thank you, puppy! So after a little hiatus after that debacle with Blogger and the age in my Google Profile (I am well past 13, thank you, but I will not send you my information! ), I’m back! 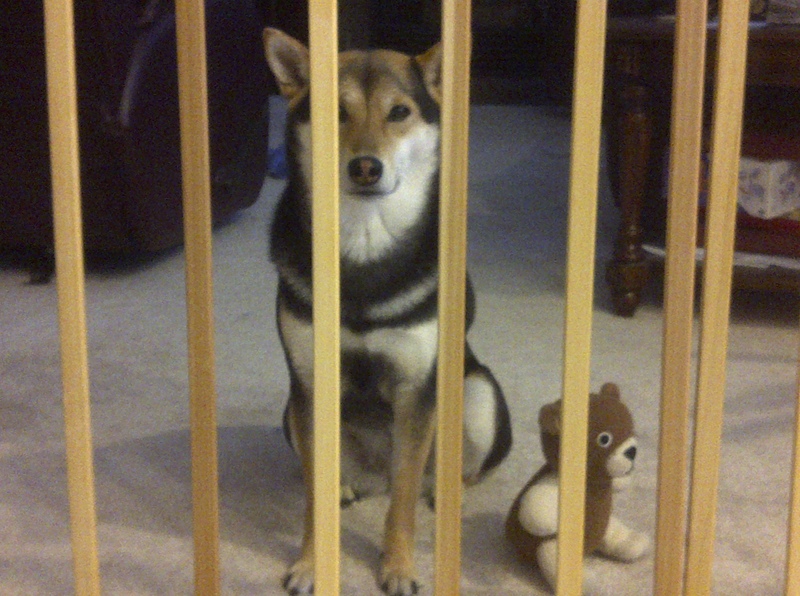 This wordpress thing is really nifty, but it’s taking some time to get it under my Shiba paw. Summer has been wonderful, exciting, and very busy. We celebrated the third anniversary of my Gotcha day and Alpha said I did fabulously on my first camping trip and my first week-long road trip! I hope to get pictures and more posts up shortly, but for now it’s good just to be back and to be free to blog again!